Karaoke Anything! works well with most songs. However, some songs work better than others. We rely on our users to let us know of songs they discover work well as karaoke songs. Click here to add a song! Karaoke Anything! 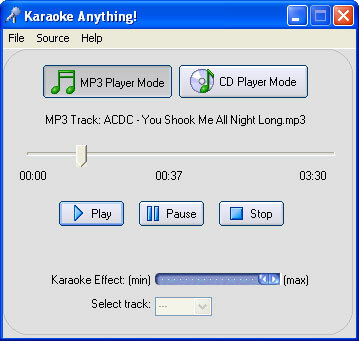 is a freeware program that lets you turn your PC into the ultimate karaoke machine! Realtime audio processing allows you to remove the vocals from almost any song making it perfect for karaoke! What song formats can you use? Karaoke Anything! supports both .mp3 files and regular CD Audio. You can either open an mp3 or simply insert an Audio CD into your CD/DVD drive and you're ready to go! Karaoke Anything! uses a vocal removing technique that sums the left channel with the inverse of the right. It then places the results into both channels. We call it the "karaoke effect". Many songs are mixed with the vocals being almost equally loud in both the left and right channels. This is done to give the effect of the vocalist being "center stage" when you play it back on your stereo. When the karaoke effect is applied to this type of recording, the vocals will disappear or come close to disappearing as they cancel eachother out. Note: the "karaoke effect" does not work on mono recordings or in stereo recordings where the vocals are mixed off center. Karaoke Anything! is freeware. It has no adware or spy ware of any kind and is not crippled in any way. You can use it as long as you like!